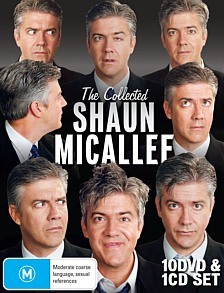 The Collected Shaun DVD Set – Shaun Micallef Online! Still, nice to see it all displayed fairly prominently in the appropriate sections of the shops. I bought this; a great set, but was quite disappointed at the omission of the New Years Rave. Will we ever be able to get our hands on it? There’s likely a bootleg around somewhere. Shaun’s said previously that he doesn’t have a problem with fans distributing the material that’s likely never to get an official release. Having said that, I have no idea where to find it. Is the DVD set still available to buy?